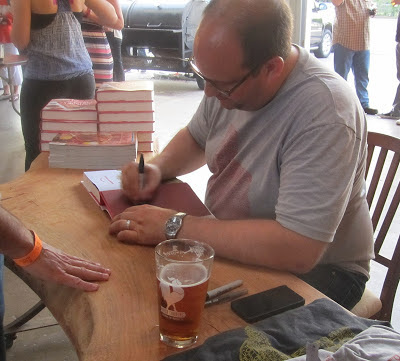 This was the second book release party the BBQ snob has had in Big D but the first I was able to attend. Even today I was stuck in a long tortuous board meeting that didn't let out until 7:30 pm. 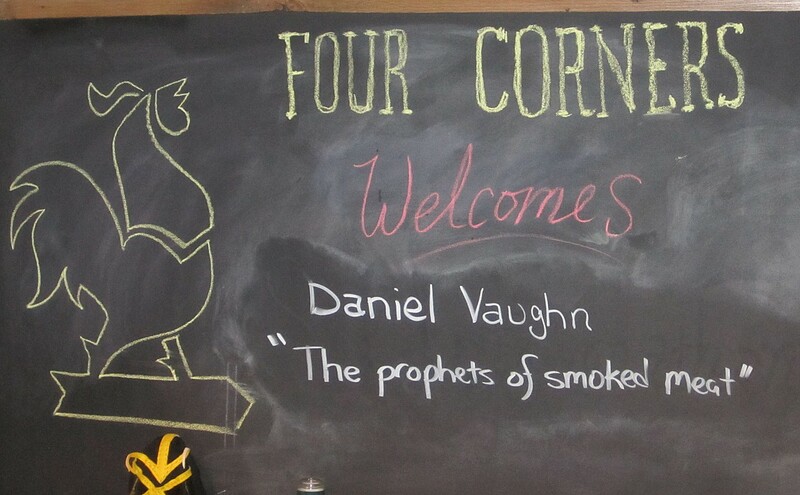 Fortunately, Daniel's party was held at 4 Corners Brewery in Oak Cliff so I had BBQ and BEER to soothe my soul. If that was not enough, there was also Daniel's new book and blues on the sound systems. The 4 B's of the apocalypse! After paying my way in I managed to say hello to the man of the hour and a get a copy of his new book. Scott had been through earlier during the VIP meat and greet but he had skeedaddled before I was able to pry myself away from my meeting. 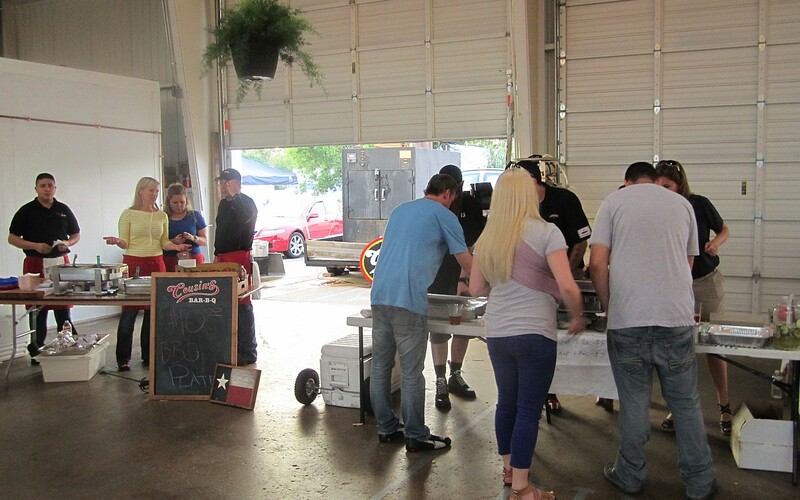 Fortunately, 2 of the three BBQ joints catering still had food left. Pecan Lodge, predictably, was out. I have had both Cousins and Lockhart Smokehouse before, but opted for the Oak Cliff joint due to their excellent spicy mac and cheese. 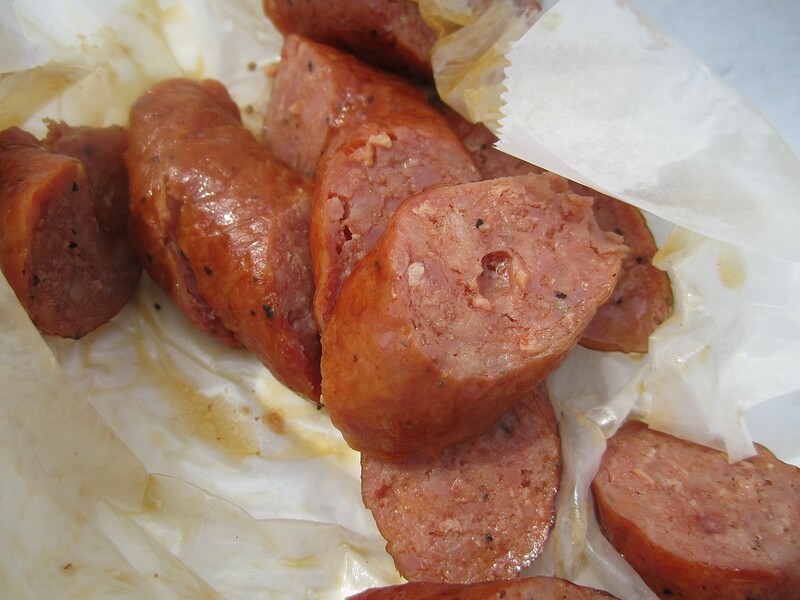 I got a $5 basket of smoked turkey, Kreuz jalapeno cheese sausage, and a good dollop of mac and cheese for just $5. Of course while juggling a book and a beer I neglected to get a shot of the food. Something Daniel would never have done, which is why he is my hero. 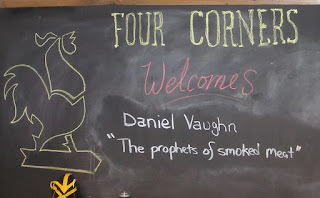 The beer from Four Corners was excellent. 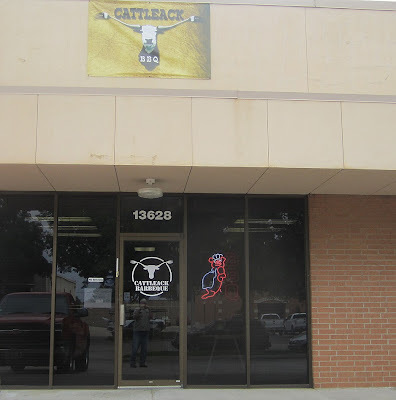 I had sampled their wares a couple of weeks back during the North Texas Beer Festival but they had neglected to bring along their fine porter for that event. I got some tonight and it beat any beer I had at the beer fest (and the wife and I sampled 26 brews). Well done 4 corners! 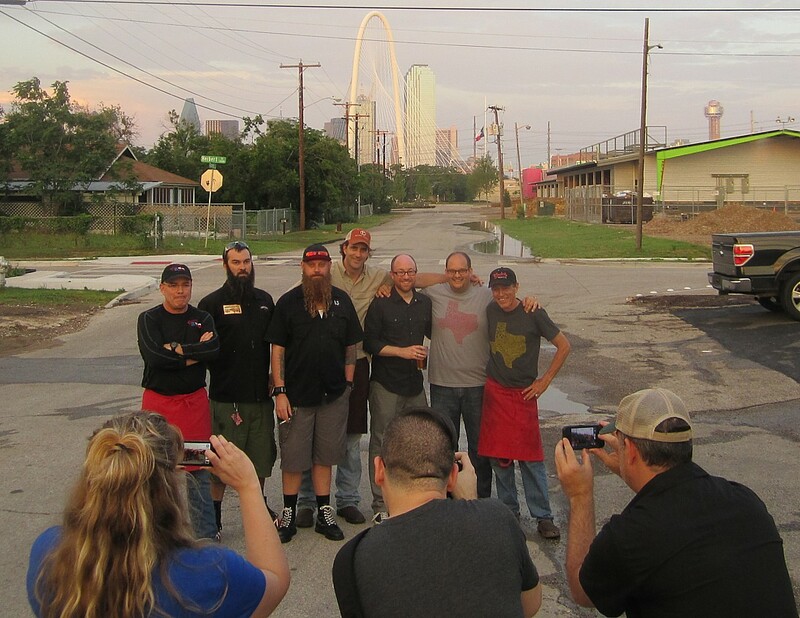 I walked around a bit and caught the papparazzi in a photo op out behind the brewery with Daniel and the pit crews from Lockhart Smokehouse, Pecan Lodge, and Cousins with the fancy overpriced Oak Cliff bridge in the background. Hah, my pix made it to publication before any of you! 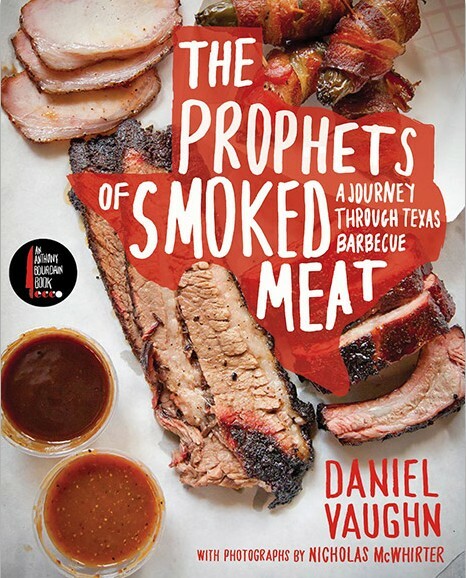 It will be awhile before I can dig into The Snob's tome but I'm sure it will be a fun jaunt through Texas BBQ. See you on the BBQ trail, Daniel! My friends at the Texas BBQ Posse (yes, The Rat Finks) recently visited this spot and gave glowing reviews so Scott and I decided to run by and give them a shot. This is mainly a catering business that now does a take-out lunch on Fridays only, starting at 11 am. It's located in a nondescript retail area just south of Addison which hardly has the ambiance of a great BBQ location. However, trusting the Posse's taste buds and knowing the proof is in the meat, I got there a bit before 11 am and waited around til they opened. I was the first customer in the door at 11 and ordered my usual brisket, ribs, and sausage with no sides. This is a meat by the pound joint, no "plates", so you get just what you order, wrapped in butcher paper, each meat in a separate package. When asked if I wanted sauce I asked "Does it need it?" 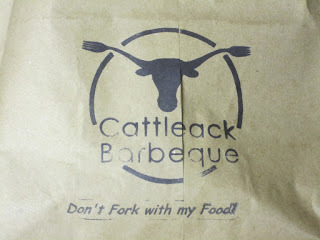 The counter man responded with a quick brisket sample which most definitely did NOT require any sauce. Pass. 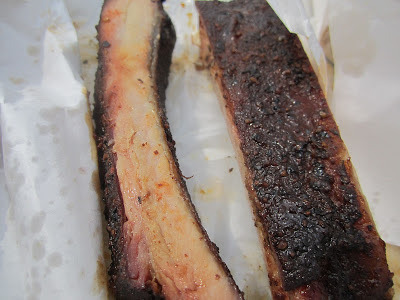 After a few quick knife slices I headed out the door to the back of my truck to enjoy half a pound of brisket, 2 pork ribs, and half a pound of sausage. The brisket was just what you would expect from the first slices of the day, perfectly moist, tender, but with a nice smoke flavor that makes the difference between average and great BBQ. Very good stuff. It passed the KCBS pull-apart test with flying colors. There was plenty of nice bark and the fat was well rendered and delicious. As always you can click on the photos for a larger view. The ribs were also well cooked and left a nice bite mark. Not too loose on the bone but very tender and an easy chew. I didn't detect much smoke in the ribs but I thought there was a hint of fruity flavor in the bark. Maybe peach or apricot. Nice ribs. I liked the sausage, too. It had the right amount of moisture for a fine grind and a nice meaty flavor. Some of the casing was a bit tough and chewy but it was way better than store bought sausage most average Q joints serve up. Maybe they'll make a jalapeno version someday. Hint, hint! In short it was well worth the 20 miles or so each way for a nice lunch I had to eat on the back of my truck. If you're closer and need some lunch on a Friday, it's a no brainer. Just remember it's to go only, no seating inside. My guess is eventually the word will get around and this will be yet another good BBQ joint for which you'll have to get there early and stand in line. Sigh. 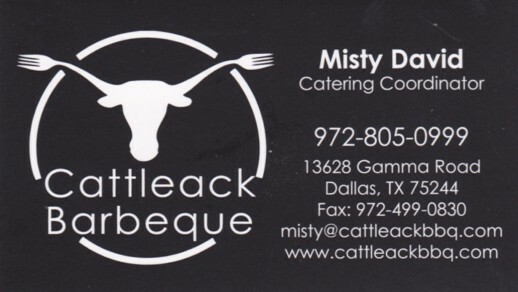 Thanks to the Texas BBQ Posse for finding another great joint. 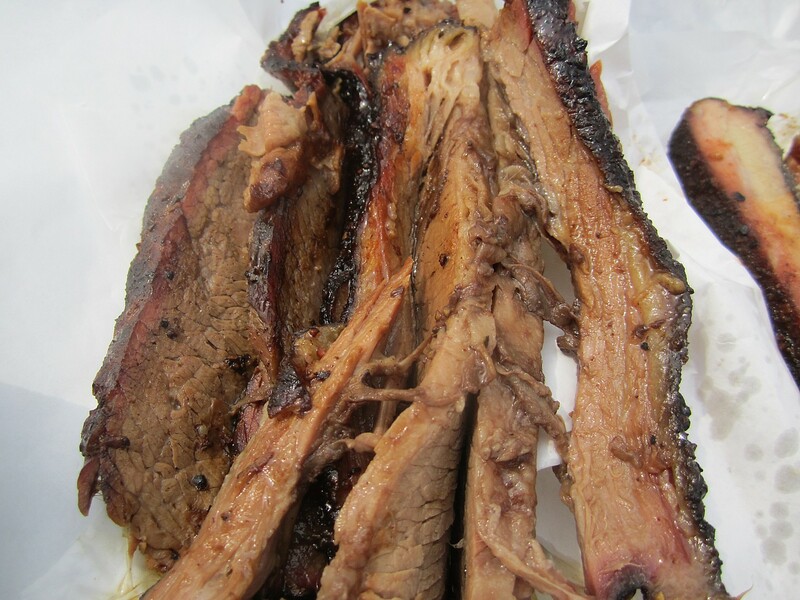 Including postage and sales tax, it came out to $17.24 a pound, which is comparable with Pecan Lodge and Franklin, but without the long wait in line. Of course, it is frozen solid so I still have to wait for it to thaw out. I guess you always have to wait for good brisket, no matter what! Fedex dropped it at my door within 24 hours of shipping. I'll take 4 pounds to the lake with me, but the other 4 will stay safely in my freezer until I'm ready to thaw it and feast. 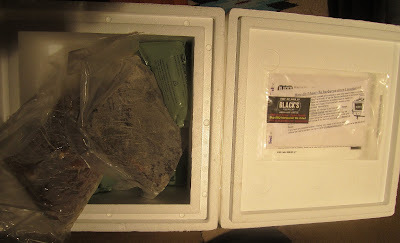 My last frozen brisket from Black's was outstanding and I expect this will be, too! If I remember right, the postage for the first 4 pounds was about $15 and the second 4 pounds only added about another $2.50. They could probably fit another 4 pounder in that shipping coffin. I shall find out next time! Man, that sure was easy! At the lake we shall dine on Black's brisket, North Main ribs, and Kreuz jalapeno cheese sausage, washed down with Murphy's Irish Stout. Now that's living! A few surprises and some old friends.